This beautiful polish is the first to grace my nails in 2014! Revlon's 'Mint Fizz' is a polish I received as part of a giveaway prize from the lovely Lauren, which I'm yet to post about in full, but thought I'd share as I've really enjoyed wearing it. This isn't the colour I'd expect from a polish named 'Mint Fizz' but actually, once it's on my nails, it does remind me of mint somehow. This applied smoothly and evenly and dried fairly quickly to a smooth, glossy finish; the colour is a bright, almost neon-turquoise blue with flakie glitter, which really is gorgeous to look at - it's quite a lot brighter than it appears in my photos. I love blue on my nails but don't wear it nearly as often as I should; I often find myself over-looking it in favour of purples and pinks. 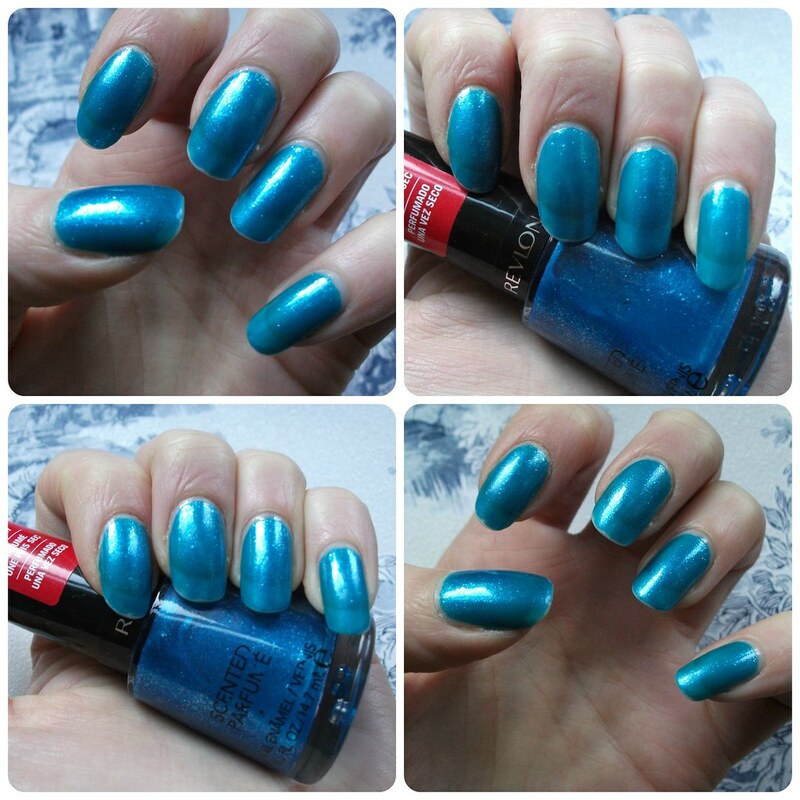 The photos below show two coats of 'Mint Fizz' over my beloved, newly-repurchased Nail Envy. There is a little tip-wear in these photos which disappoints me as I'd had the polish on less than 24 hours before taking them; then again, I had done a shift at work in that time which is always tough on my polish, and I hadn't used a top-coat, so it's my own fault really! I'd also like to point out that the polish is nowhere near as sheer in real life as it looks in these photos; I have no idea why it looks that way, but it just would not photograph accurately! You may also be able to see on the bottle there's a label which claims, 'Scented when dry'. I was intrigued by this and although there is the usual nail polish scent whilst applying this, it does indeed dry to have a scent, a lovely fresh minty fragrance which lasted around a day, and is obviously where the shade name comes from. All in all, this is a lovely little polish which I think will be beautiful year round (I can see me wearing it on my toes a lot come summer!) and I'm very glad to be adding it to my collection - thank you Lauren! 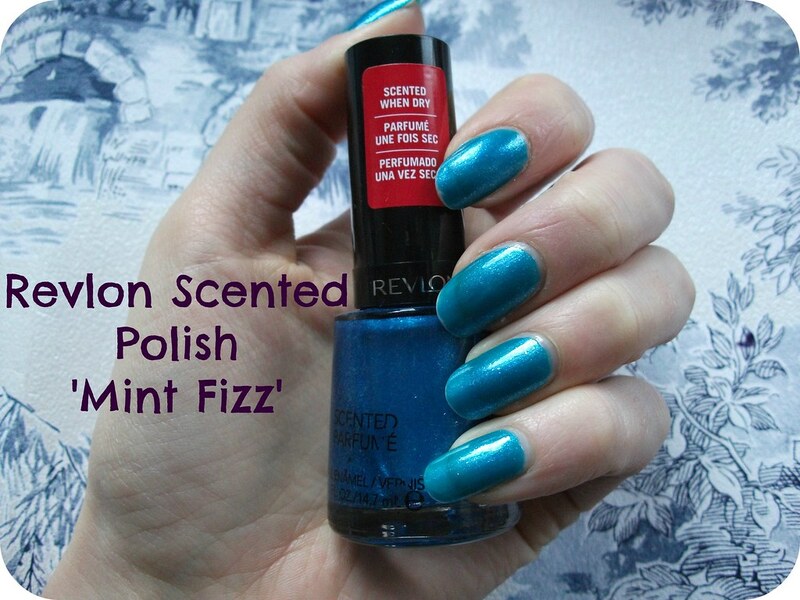 You can purchase Revlon's 'Mint Fizz' from Superdrug and other retailers with an RRP of £6.49 for 14.7ml of product. Have you tried any of Revlon's scented polishes? What were your thoughts? What do you think of this shade? This is a lovely colour! I'm always a sucker for blue polishes and I think this one might have to find it's way into my collection at some point..
Thats a super cute color!!! What a beautiful color! Your nails look so long and healthy! I wish mine grew that long without breaking!! So how long does the scent last? I didn't try it because it really does seem like a gimmick to me. I hate it when nail polish just wont photograph right though! Have never tried something like this, loved the blue color, beautiful NOTD too.